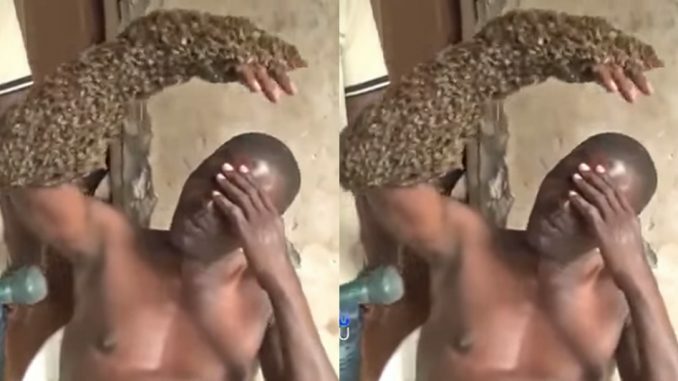 This video of a man’s hand covered with live bees in Uganda has gone viral online and it is trending for obvious reasons. It was reported that the man stole a car so the owner of the vehicle cursed him using Black Magic (Juju). Now, almost his entire right arm is covered in crawling live bees that won’t leave no matter how much he takes a swipe at them. The man from Uganda is constantly in pain and granted an interview asking for help. The video has sparked outrage from users as many condemned the wicked act.